Bhupinder, terrific post man. We need to have memories, and if we dont, its good to have some one to remind us. great work man !! Thanks, BVN. Just wanted to get it off my chest. Reminds me of the term used to describe Muhammad bin Tughlaq by many Indian historians. They call him the “transendental failure”. (though comparing Gorbachev and Tughlaq may not be appropriate. Good comparison. 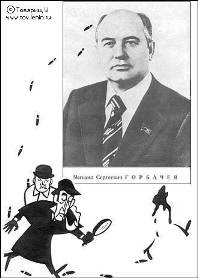 Gorbachev turned out to be a very inept leader, whose dramatic rise was overshadowed by his inglorious fall. Humpty Dumpty also comes to mind. socialists as dreamers? first, you introduce the idea that an elitist agenda was a national ‘ethos’ and now you project this little myth that the socialists were agreeable dreamers… when the hindutvavadis rewrite history we know they’ve been there. but when the socialists do it… they do such a clean job !. I did not get your point, Kuffir. Can you clarify? sorry for responding so late to your query. but my disagreement is with the use of the term ‘dreamers’- it seems to suggest naive, harmless romantics, which they were definitely not. weren’t they planners with designs on everything in the world?.. and like all planners, who suspect that they might go wrong, this blame-the-west-for-everything gambit seems like a convenient escape route. russia imploded from the inside, collapsed in on its own unviable economic/social structure. and this was bound to happen in the initial years of the perestroika etc., whichever economic/ideological prescription russia followed, in my view. Of course the communists were exceptionally good planners and had a well oiled party machinery- which is the reason the Bolsheviks ‘picked up the Revolution when it was lying in the streets of St. Petersburg”, in Trotsky’s memorable quote. But they were dreamers too- at least many among them. Who else would have imagined building socialism in a peasant Russia? Then there was the short lived resurgence in the early 1920s, before it was smothered under Stalin’s iron hand. Some of these dreamers were the first to lose heart as well- remember Arthur Koestler and others who wrote The God That Failed. I think your explanation of the Soviet Union’s collapse is rather deterministic (and let me add, tongue in cheek :-), in the tradition of mechanistic Marxism. The Western intervention came much later, I feel that it was the Soviet leadership, above all, Mikhail Gorbachev, that failed. More probably, it was a combination of both subjective and objective factors.